The majority of young people taking part in traineeships have gone on to apprenticeships, employment or further learning, according to government research published today. The outcome of an initial government evaluation of the first year of the programme found that half of trainees went on to apprenticeships or employment, and a further 17 per cent undertook further learning. Skills Minister Nick Boles, in a framework for delivery document also out today that references the research results, said: “We owe it to young people to retain this focus on quality outcomes, which is why we have strengthened the use of performance data from 2015/16. The research went on to highlight high levels of satisfaction in the programme among employers and trainees with 84 per cent of providers and 94 per cent of employers consider traineeships an effective way of increasing young people’s chances of finding paid jobs and apprenticeships. It also showed how the majority of trainees (82 per cent) said that the traineeship at least matched their expectations, with over half (54 per cent) saying it exceeded their expectation. Meanwhile four-in-five trainees (80 per cent) said that the support they received during their work preparation training had helped to improve their job search. Stewart Segal, chief executive of the Association of Employment and Learning Providers, told FE Week: “We are pleased with the findings of this research on traineeships. “The overall satisfaction ratings from trainees at 80 per cent is very high considering that this is still a new programme. Traineeships launched in August 2013 with the aim of giving young people high quality work experience and training to help them into an apprenticeship or employment. In December, FE Week revealed how Job Centre Plus (JCP) staff had been set a target of 10,000 traineeship referrals this academic year amid concerns the programme had not been promoted to benefit claimants because it extended their time out of work. And information in the statistical first release (SFR) last month showed 5,000 starts on the programme in the first quarter of this academic year, compared to 3,300 in the first six months of 2013/14. The research was based on interviews with 1,590 trainees who started between August 2013 and and July last year, 200 traineeship providers and 218 participating employers over the same period. The results come just days after the House of Commons Education Select Committee reported that the impact of the programme was unclear, and called for greater clarity from the government on the success criteria for the programme. 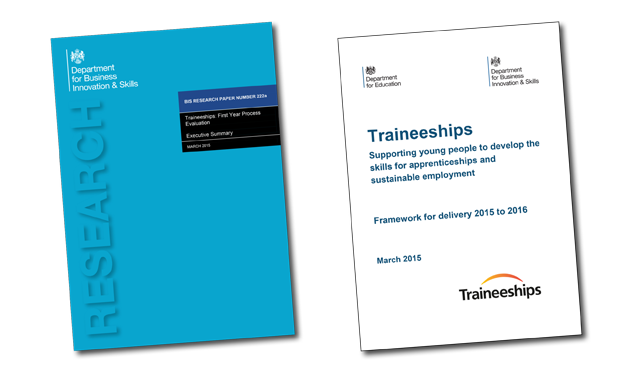 However, a full impact assessment of traineeships will be undertaken over the next two years. See edition 132 of FE Week, dated Monday, March 16 for more on the government’s traineeship research.